Another week, another red-hot problem for Samsung. 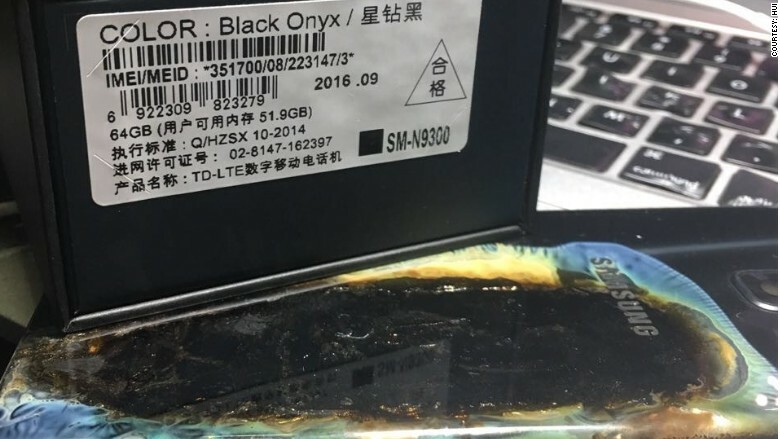 A new Galaxy Note 7, bought this week in China, burst into flames while charging, its owner told CNNMoney. Hui Renjie, a 25-year old tech worker, said he ordered his Samsung device on Sunday from online retailer JD.com. It was delivered the same day. Hui charged the smartphone overnight, but noticed early the next morning that something was wrong. He said that it began to emit black smoke while still connected to the charger, and then burst into flames. 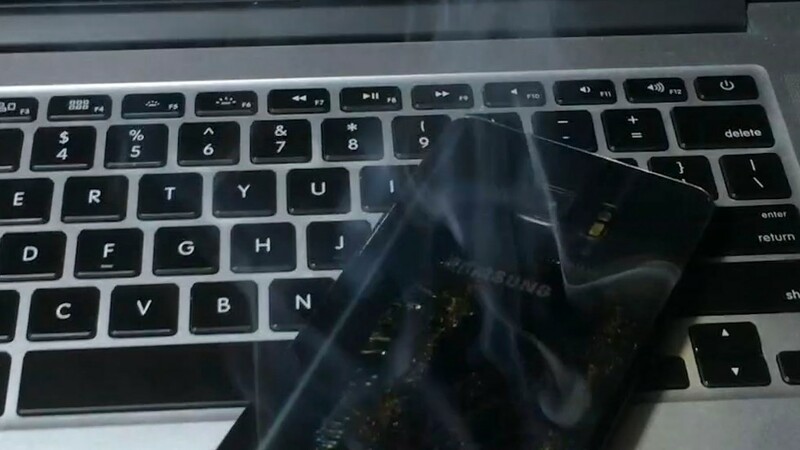 A video Hui provided shows a cracked, smoking smartphone connected to a charger. CNNMoney could not confirm the authenticity of the video, but Hui provided an image of a receipt and photographs that support his version of events. Samsung (SSNLF) said it was investigating the incident. "We are currently contacting the customer and will conduct a thorough examination of the device in question once we receive it," the company said in a statement. A photo provided by Hui shows the aftermath of the fire. Samsung's reputation suffered a huge blow following its decision to recall 2.5 million Note 7s in early September after reports of battery fires in some devices. China was not included in that recall because the batteries in the phones sold there came from a different supplier, Samsung said at the time. Hui says his Galaxy Note 7 came in this box. Since then, there have been four reports of battery fires in China. The South Korean firm has rebutted at least two of the reports. 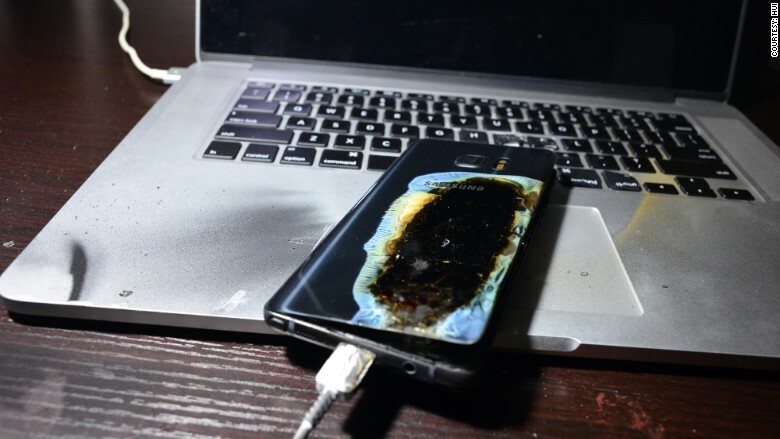 In one case, Samsung conduced an investigation and concluded that the fire was caused by an external heat source rather than a battery. But the world's largest smartphone maker is facing claims that it's not treating Chinese customers fairly. The website of Global Times, a tabloid newspaper affiliated with the ruling Communist Party, has published multiple articles criticizing Samsung. One cited an expert as saying that Samsung should explain how the Note 7 batteries in the Chinese market differ from those in the rest of the world. Samsung says the battery problem had been found in a tiny fraction of Note 7 phones but it was replacing all those with the potentially faulty batteries "because our customers' safety is an absolute priority." Aviation authorities around the world have warned Note 7 owners not to use or charge the phones on planes. -- Serenitie Wang and Jethro Mullen contributed reporting.